3/4" knockouts fornecting conduit, etc. 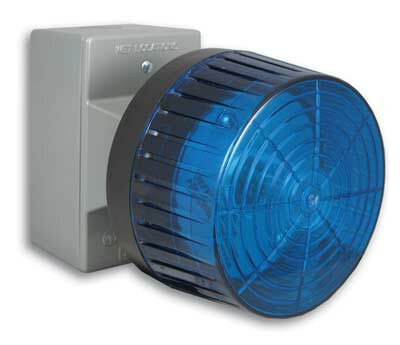 The BLK-4 from Viking is a phone strobe light designed that provides high visibility indication of analog line status through a high powered 360º LED strobe and/or beacon visual indicator. The BLK-4 is perfect for the hearing impaired and can be used equally well in loud warehouses or factories, where ringing phones cannot be heard. The BLK-4 Strobe light can also be used to add emergency notification to pre-existing emergency phones by turning on the strobe light when the emergency phone is in use. The included control module can be installed on any standard telephone line or analog PABX/KSU station. The strobe can also be triggered by the relay contact output of the 1600-IP Series emergency phones. Great for loud areas such as Repair shops, manufacturing, industrial, garages, and more.